"Cities and towns where Australians live, generally concentrated near the coast, will be affected by sea-level rise and storms and, in the North, by more intense cyclones. Heat related deaths in Australia's major urban centres are expected to become five times more frequent by 2050." This page copies just the Australian Chapter of the cited Report by Friends of the Earth. The full report is much more extensive, and downloadable as an Adobe PDF file through the link below. Copyright for this page remains with Friends of the Earth Australia, and authors Polly Buchhorn & Stephanie Long. Droughts and bushfires have been persistent threats throughout Australia's 200 years of European settlement. Nowa seven-year drought, punctuated with extreme bushfires, is exposing the nation's vulnerability to climate change. 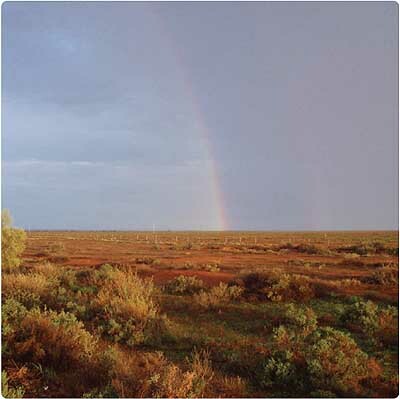 Australia is a wealthy, resource-rich country with the ability to adapt; but it is also the world's driest inhabited continent, with ecosystems that are highly vulnerable to climatic change. Although recent events have crystallized public awareness of the climate threat, Australians remain the industrialised world's highest per capita emitters of greenhouse gases, and their Federal Government continues to undermine international efforts to curb emissions. on december 2006 bushfires: Living out in the Australian bush and knowing a bit about its bushfires, I had thought of the worst case: That the drought had dried the eucalyptus forests all around our community so that, if ignited on a day of extreme fire weather, they could literally explode, an uncontrollable inferno that could destroy farms, homes, animals and perhaps people. But I never really thought it would happen. When it did happen the bushfire brought my community to its knees, for a time. My family and I were lucky. We lost some fences, but others lost their homes. The roads and town water supply were cut, electricity lines were burnt down and the phones, radio and television were dead. Later one young fire fighter lost his life. a fortunate community: Shocked, I expected the phone, electricity, roads and water to be out for weeks. Yet just two days later the lights, fridge and phone all worked and the road was reopened. on a fiery future with climate change: Even if this bushfire wasn't attributable to climate change, it was just what was expected for my community in decades to come: more drought, extreme weather and bushfires. I knew that we, in well-off Australia,were expected to cope with such consequences of climate change relatively well. That millions of people in the world haven't the capacity to recover from such damage in two days - let alone having electricity, water and telephones and cars in every home - put a different light on the devastation and trauma we faced. I was unsettled by the flood of emergency aid that followed ... We Australians like to share a cold beer from the fridge after a tough day, but after beating this bushfire it didn't quite taste right. There has been a really good thing to come from this bushfire: my community has become more resilient, and thoughtful. "The fire came out of the drought: The drought put people on edge, especially fire fighters and farmers. The blaze came so early in the fire season -- people knew straight away it was serious." Hanna Rubenach, 29-year-old volunteer fire fighter, student and disability support worker. Though Australia is already a hot, dry continent, climate change is expected tomake it hotter still, with average temperatures likely to increase by up to 1.3°C by 2020, and 6.7°C by 2080, according to the UN Intergovernmental Panel on Climate Change (IPCC). Reduced rainfall andmore evaporationmean that "water security problems are projected to intensify by 2030 in southern and eastern Australia," according to the IPCC. These changes will create problems for agriculture. Fruit and nut crops will suffer due to lack of required winter chilling; grain quality will decline due to heat shock; livestock will experience more heat stress, and productive pasture will be lost. Forestry production will also drop in many parts of the country. Cities and towns where Australians live, generally concentrated near the coast, will be affected by sea-level rise and storms and, in the North, by more intense cyclones. Heat related deaths in Australia's major urban centres are expected to become five times more frequent by 2050. Also at risk are Australia's plant and animal species, many of which are found nowhere else in the world. Even small temperature increases could lead to extinctions. For example, Great Barrier Reef tourism generates about USD 4.5 billion per year, and provides about 63,000 jobs. Yet in coming decades warming oceans could send the reef's corals into serious decline. the fingerprint of climate change? drought torture: Rainfall records have been kept here at Seaview Farm since 1929. We expect 40 inches of rain a year, but last year we received just 16 inches, the lowest by far, ever. Day by day it got drier and drier, it was relentless. Everyone's pastures, crops, livestock and streams shrivelled; old-timers said the creeks had never dried up, but we had barely enough water in the creek to keep our cherry orchard alive. We'd already lost the crop to frost. Then the bushfire came with more extreme weather. We're pretty safe at the house. We had to fight to protect our young blueberries but we were cut off fromour cherry orchard. Some big farms nearby are sceptical about climate change's role and future threat. We're worried erratic weather can upset things in somany ways we can't plan for. Our blueberries might not get enough winter chilling, will there be water for irrigation, how muchmore fodder should we keep on hand? reacclimatising farming practices: A few years ago we started amove to "biological farming" practices using non-chemical fertilisers and rebuilding soil ecology to restore natural systems. And we've been making bio-diesel to run the irrigation pump and tractor. After the bushfire, the drought's impact persisted and forced our neighbour to sell off a lot of his livestock. But our animals and pastures were in good condition, and we started buying more animals. People came and shook their heads, but we're certain, after the drought, we came out of it so well because of our switch to biological farming. If we are going to be affected by climate change in the future we'll have to find new ways of farming. Conventional "big" farming might turn a lot of farmland into a dust bowl. With an uncertain climate we need to be flexible and diversify our farming, and learn to farmwith nature, rather than fight it. In cities, water shortages are amajor issue. Reservoir levels have hovered at alarmingly low levels in recent years -- around a fifth of capacity inmajor cities including Brisbane, Sydney, Melbourne and Adelaide. Despite recent rains, cities like Melbourne are maintaining stringent water restrictions to ensure water storage levels improve. Adelaide currently faces the possibility of running out of water by the summer of 2008-09 due to lack of winter rain in 2007. The Murray and Darling Rivers are part of Australia's largest drainage basin, home to about 70 percent of the country's irrigated agriculture and more than half of its food production. Yet in December 2006, less water flowed into the Murray River than at any time in the past century, leaving irrigators with a major water deficit and compromising the river's ecological health. The Murray-Darling's poor state has had a major impact on agriculture. In March 2007, a government bureau stated that "Severe drought across southern and central Australia is projected to reduce farm incomes in 2006-07 to their lowest level in over thirty years." Another extremely bad drought year, in 2002-3, slashed Australia's economic growth by about AUD 6.6 billion. Total rural employment fell by almost 80,000 jobs between 2001 and 2005. Behind these statistics is the human face of the drought. Farmers have been forced to shoot livestock rather than let animals starve. Crop failures have meant the loss of family farms held for generations, despite government drought assistance. Bushfires are a seasonal threat in Australia, but in 2006, the season began in October -- an unusually early start. As temperatures spiked and wind speeds rose, bushfires were ignited in New South Wales. By December, fires also raged across Victoria and Tasmania. The fires continued formore than two months, compelling up to 3,000 fire fighters to work daily to tame blazes that often proved uncontrollable. Fire fighters spoke of severe fire behaviour they couldn't explain or deal with, of "megafires" moving at extreme speed, covering many kilometres in every direction, with towering flames and intense heat. The longest-burning fire, in Gippsland, Victoria, took more than 19,000 fire fighters 69 days to contain, and razed more than one million hectares of public forests and alpine areas. Nor can Australians be complacent about the future: the frequency of very high and extreme fire danger days is likely to increase by up to 25 percent by 2020, and 70 percent by 2050, across south-eastern Australia, according to the IPCC. Aboriginal peoples are among Australia's most vulnerable to climate change. More than 100,000 live in remote communities, many of which lack adequate infrastructure, health services and employment -- disadvantages that may restrict their ability to cope with climate hazards, according to the IPCC. Direct impacts include heat stress, loss of traditional food sources, and more food- and water-borne illnesses. Most Aboriginal Australians live in the country's north, often in low-lying tropical areas vulnerable to storm surges and floods -- events expected to be on the rise as the planet warms. Sea level rise of one or two metres would wipe out dozens of populated homelands and islands, particularly those in the Gulf of Carpentaria and adjacent Torres Strait. The Torres Strait Islands, scattered across 22,000 square kilometres between Australia and Papua New Guinea, are home to more than eight thousand people. Many live onlymetres from the beach, sometimes less than one metre above sea level. In early 2006, high tides, strong winds and heavy rain caused severe damage to half the region's inhabited islands. Homeswere damaged, sewage systems flooded and belongings lost. Islanders report such events as increasingly common. The Yorke Island chairperson, Mr Donald Mosby, is in no doubt that global warming is to blame. "You don't have to be a scientist,"he said, "not when you see metres of beach disappearing every week." on fighting local 2006 bushfires: The fire came out of the drought: The drought put people on edge, especially fire fighters and farmers. The blaze came so early in the fire season - people knew straight away it was serious. Air humidity of 15 percent is bad, but it got well below 10 percent and the wind was very strong. We were powerless in the face the fires' speed, size and ferocity; the community wasn't ready for this. People were shocked, and angry. Angry towards the extreme bushfire conditions that caused so much loss and fear. And angry for the cuts to services that took some time to rebuild. The fire burnt power lines and telephone lines, the radio, television and mobile phone transmission towers, and blocked roads with fallen trees and rocks. From all over an enormous community spirit and generosity came to. Letters from other volunteer fire brigades gave my exhausted brigade a boost. From across all of Tasmania and Australia came donations and support that lifted people up again. responding to climate change: That drought is expected with climate change, people here know. Still six months from the next summer people are already thinking about protecting themselves from bushfire. They are conscious of climate change meaning more drought and extreme weather, but are mainly concerned for local needs and personal protection. I know about the global aspects of the problem of climate change. But I don't know how to make them more aware of the links with the drought and fire and the wider implications it has for how we live here. The most fundamental step toward dealing with climate change is to stop fuelling the problem. Yet Australia's energy emissions are soaring. Coal power supplies about 85 percent of our electricity, and Australia remains the world's biggest coal exporter. Captive to fossil fuel industry interests, the current federal government has refused to ratify the Kyoto Protocol, and has generally obstructed meaningful international progress. On a more positive note, climate change is now firmly fixed on the public radar. A convergence of events including the drought, the film An Inconvenient Truth, and the Stern Review have given climate change a high profile. With a national election due in late 2007, politicians are full of climate change pronouncements and international posturing. Bids for emissions cuts are slowly rising, and there is hope for policies that would recognise and accept climate refugees. Despite billions of dollars spent on drought relief, many farmers have faced bankruptcy and loss of their farmland. Authorities say climate change will create both winners and losers, and that there are ways agriculture could adapt (new crop varieties, new farmpractices, and shifting cropping to wetter regions). However, these changes will require investment and major management changes for farmers. Debates about building more dams, water recycling and energy-intensive desalination plants regularly make headlines. Many urban Australians have been forced to embrace water-saving measures never required before. More people are installing rainwater tanks, thanks to government rebates. In future, storm water capture and recycling could play a major role in urban water supply. A new national water plan is attempting to grapple with the Australia's over-allocated water supply and conflicting user demands, however, water use in Australia is still far from sustainable. Australia's coastal population is large and growing, and the threat of future sea level rise to homes, roads and other infrastructure is now being taken seriously. Local councils and planning authorities have begun to take planning and regulationmeasures, crucial steps if continued rates of coastal development are to be sustainable, according to the IPCC. Some of Australia's most celebrated natural wonders have little or no potential to adapt to climate change. The Wet Tropics and upland rain forests, the alpine snow country, and the Great Barrier Reef are faced with a rapidly changing climate. Yet the species that make up these ecosystems simply have nowhere to go, or cannot migrate quickly enough. A dry, hot country with a history of drought and bushfires, Australia has been described as a portal into the world's future with climate change. While we cannot be certain that climate change is behind the current drought, there is no doubt about the threat posed by a hotter future. Though wider Australian society has the resources to adapt, many among its Aboriginal population are not so fortunate. Furthermore, even low levels of climate change have the potential to alter the country's landscape and wipe out unique forms of life. Since much will depend on collective international efforts to reduce emissions, Australians must continue to press for change from their federal leaders, who have so far resisted any binding emissions cuts at home. Relative to 1990 temperatures; refers to areas 800 km from the coast; central Australian increases are expected to be greater. (IPCC, 2007, www.ipcc-wg2.org, p. 515). ABC News, Thursday September 6, 2007, National drought expected to continue, experts say. Dr Donna Green, "Climate Change and Health: Impacts on Remote Indigenous Communities in Northern Australia". CSIRO, 2006." Climate Change 2007: Impacts, Adaptation and Vulnerability. Contribution of Working Group II to the Fourth Assessment Report of the Intergovernmental Panel on Climate Change.